It was 101 years ago on April 12, 1910, that William Graham Sumner died. He had been born nearly 70 years earlier on October 30, 1840, almost 30 years to the day before the birth of another American libertarian, Albert Jay Nock, whose career bears a striking, if superficial, similarity to Sumner's. Like Sumner, Nock began his career, while still in his 20s, as an Episcopal clergyman. Like Nock, Sumner went into such work largely to please his family. But the job was a poor fit for both men. Nock walked away from it after little more than a decade. Sumner didn't make it even five years. Both men moved on directly from religious employment to the work for which they came to be best known: Nock, at the age of 40, moved on to the magazine journalism for which he became famous in the 1920s and '30s; Sumner, while still in his early 30s, moved on to a position as professor of political economy at Yale, which he held for the rest of his life. Today neither Nock nor Sumner is particularly well known, and those who do know of Sumner (those who don't confuse him with Charles Sumner, the abolitionist senator from Massachusetts) probably know him as a "social Darwinist." And this is ironic, for he was not so known during his lifetime or for many years thereafter. Robert C. Bannister, the Swarthmore historian, edited a valuable collection of Sumner's essays nearly two decades ago for Liberty Fund. This is how he describes the situation in his foreword to that volume: "Sumner's 'social Darwinism,'" he writes, "although rooted in controversies during his lifetime, received its most influential expression in Richard Hofstadter['s] Social Darwinism in American Thought," which was first published in 1944. In fact, there is considerable evidence that the entire concept of "social Darwinism" as we know it today was virtually invented by Richard Hofstadter. Eric Foner, in an introduction to a then-new edition of Hofstadter's book published in the early 1990s, declines to go quite that far. "Hofstadter did not invent the term Social Darwinism," Foner writes, "which originated in Europe in the 1860s and crossed the Atlantic in the early twentieth century. But before he wrote, it was used only on rare occasions; he made it a standard shorthand for a complex of late-nineteenth-century ideas, a familiar part of the lexicon of social thought." In the process, he not only portrayed William Graham Sumner as a "social Darwinist"; he also portrayed Herbert Spencer that way. In fact Richard Hofstadter seems to be the principal source of the widespread modern belief that both these men were "social Darwinists." But were they? What precisely is this "complex of late-nineteenth-century ideas," as Eric Foner puts it, that the phrase "social Darwinism" is supposed to stand for? Perhaps the most frustrating thing about doing a little general reading in this field is discovering how difficult it is to find any sort of definition of that phrase — "social Darwinism" — especially if one is hoping to find a succinct and quotable definition of it. Entire books are written on the subject without ever carefully and clearly delimiting exactly what that subject is. In essence, however, "social Darwinism" seems to be the notion that success in the market proves an individual's fitness to survive in the struggle for existence, so that both legislation and private charity meant to assist those who fail in the market are inadvisable, since our species will grow stronger if these "unfit" individuals are allowed to die off. Did anyone ever espouse this doctrine? Herbert Spencer certainly didn't. Spencer, who was born 191 years ago on April 27, 1820, was an enthusiastic exponent of evolution, true enough. In fact, he wrote about evolution before Darwin did. In fact, it was Herbert Spencer, not Charles Darwin, who coined the phrase "survival of the fittest." But Spencer was no sort of Darwinian at all. Even after Darwin began publishing, Spencer remained a Lamarckian, a disciple of an earlier advocate of evolution who believed organisms could pass on acquired characteristics to their offspring. In the case of humans, Spencer's view was that culture and education made this process possible. Also, Spencer was a proponent of private charity. 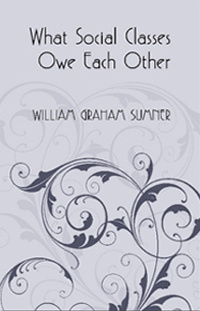 Was William Graham Sumner an advocate of "social Darwinism"? As I have indicated, he has been so described, most notably by Richard Hofstadter and various others over the past 60-odd years. Robert Bannister calls this description "more caricature than accurate characterization" of Sumner, however, and says further that it "seriously misrepresents him." 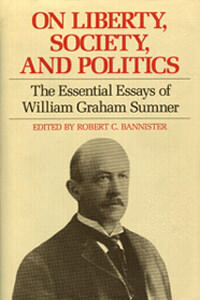 He notes that Sumner's short book, What Social Classes Owe to Each Other, which was first published in 1884, when the author was in his early 40s, "would … earn him a reputation as the Gilded Age's leading 'social Darwinist,'" though it "invoked neither the names nor the rhetoric of Spencer or Darwin." It is interesting, in fact, to take a look into its pages and see what it is exactly that What Social Classes Owe to Each Other does propound. Below are some passages that I think fairly represent the book's central concerns and propositions. One of those concerns was the history of human civilization, particularly its political component. "The history of the human race," Sumner wrote, "is one long story of attempts by certain persons and classes to obtain control of the power of the State, so as to win earthly gratifications at the expense of others." All this began, according to Sumner, "in ancient times [when] organized bands of robbers … plundered laborers and merchants," until, eventually, "they found that means of robbery which consisted in gaining control of the civil organization — the State — and using its poetry and romance as a glamour under cover of which they made robbery lawful." By "the civil organization," here, Sumner seems to mean whatever local or tribal organization provided the bundle of services — community defense, adjudication of disputes, identification and apprehension of wrongdoers — that Albert Jay Nock called "government." The bands of robbers took over the local government and transformed it into a state. And, of course, "they developed high-spun theories of nationality, patriotism, and loyalty" to justify these nefarious deeds in the minds of their victims. the fashion of the time [Sumner is referring here to the 1880s] is to run to Government boards, commissions, and inspectors to set right everything which is wrong. No experience seems to damp the faith of our public in these instrumentalities. The English Liberals in the middle of this century seemed to have full grasp of the principle of liberty, and to be fixed and established in favor of non-interference. Since they have come to power, however, they have adopted the old instrumentalities, and have greatly multiplied them since they have had a great number of reforms to carry out. They seem to think that interference is good if only they interfere. In this country the party which is "in" always interferes, and the party which is "out" favors non-interference. lose all true education in liberty." I found it startling after reading that passage to be reminded that Sumner was writing here about the Republican and Democratic parties as they were 130 years ago. Little wonder that, as Robert Bannister tells us, Sumner had experienced "disillusionment with politics" as early as 1877 and had "repudiated politics as a waste of time" by 1880, "declining even to vote" in that year's presidential election. There were, Sumner said, only "two notions" to choose from in making political decisions. One was the notion that the state should "regulate things by a committee of control, and the other to let things regulate themselves by the conflict of interests between free men." These two notions, he said, "are diametrically opposed; and the former is corrupting to free institutions, because men who are taught to expect Government inspectors to come and take care of them lose all true education in liberty." the ties by which all are held together are those of free co-operation and contract. If we look back for comparison to anything of which human history gives us a type or experiment, we see that the modern free system of industry offers to every living human being chances of happiness indescribably in excess of what former generations have possessed. It offers no such guarantees as were once possessed by some, that they should in no case suffer. We have an instance right at hand. The Negroes, once slaves in the United States, used to be assured care, medicine, and support; but they spent their efforts, and other men took the products. They have been set free. That means only just this: they now work and hold their own products, and are assured of nothing but what they earn. In escaping from subjection they have lost claims. Care, medicine, and support they get, if they earn it. Will anyone say that the black men have not gained? Will anyone deny that individual black men may seem worse off? Will anyone allow such observations to blind them to the true significance of the change? If anyone thinks that there are or ought to be somewhere in society guarantees that no man shall suffer hardship, let him understand that there can be no such guarantees, unless other men give them — that is, unless we go back to slavery, and make one man's effort conduce to another man's welfare. has one big duty. That is, to take care of his or her own self. This is a social duty. For, fortunately, the matter stands so that the duty of making the best of one's self individually is not a separate thing from the duty of filling one's place in society, but the two are one, and the latter is accomplished when the former is done. The common notion, however, seems to be that one has a duty to society, as a special and separate thing, and that this duty consists in considering and deciding what other people ought to do. Now, the man who can do anything for or about anybody else than himself is fit to be head of a family; and when he becomes head of a family he has duties to his wife and his children, in addition to the former big duty. Then, again, any man who can take care of himself and his family is in a very exceptional position, if he does not find in his immediate surroundings people who need his care and have some sort of a personal claim upon him. If, now, he is able to fulfill all this, and to take care of anybody outside his family and his dependents, he must have a surplus of energy, wisdom, and moral virtue beyond what he needs for his own business. No man has this; for a family is a charge which is capable of infinite development, and no man could suffice to the full measure of duty for which a family may draw upon him. Neither can a man give to society so advantageous an employment of his services, whatever they are, in any other way as by spending them on his family. Upon this, however, I will not insist. I recur to the observation that a man who proposes to take care of other people must have himself and his family taken care of, after some sort of a fashion, and must have an as yet unexhausted store of energy. the danger of minding other people's business is twofold. First, there is the danger that a man may leave his own business unattended to; and, second, there is the danger of an impertinent interference with another's affairs. The "friends of humanity" almost always run into both dangers. I am one of humanity, and I do not want any volunteer friends. I regard friendship as mutual, and I want to have my say about it. I suppose that other components of humanity feel in the same way about it. If so, they must regard anyone who assumes the role of a friend of humanity as impertinent. The reference to the friend of humanity back to his own business is obviously the next step. Yet we are constantly annoyed, and the legislatures are kept constantly busy, by the people who have made up their minds that it is wise and conducive to happiness to live in a certain way, and who want to compel everybody else to live in their way. Some people have decided to spend Sunday in a certain way, and they want laws passed to make other people spend Sunday in the same way. Some people have resolved to be teetotalers, and they want a law passed to make everybody else a teetotaler. Some people have resolved to eschew luxury, and they want taxes laid to make others eschew luxury. The taxing power is especially something after which the reformer's finger always itches. 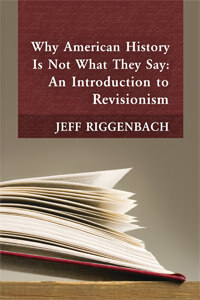 Sometimes there is an element of self-interest in the proposed reformation, as when a publisher wanted a duty imposed on books, to keep Americans from reading books which would unsettle their Americanisms; and when artists wanted a tax laid on pictures, to save Americans from buying bad paintings. no one of us lives up to what he knows. The man struck by the falling tree has, perhaps, been careless. We are all careless. Environed as we are by risks and perils, which befall us as misfortunes, no man of us is in a position to say, "I know all the laws, and am sure to obey them all; therefore I shall never need aid and sympathy." At the very best, one of us fails in one way and another in another, if we do not fail altogether. Therefore the man under the tree is the one of us who for the moment is smitten. It may be you tomorrow, and I next day. It is the common frailty in the midst of a common peril which gives us a kind of solidarity of interest to rescue the one for whom the chances of life have turned out badly just now. Probably the victim is to blame. He almost always is so. A lecture to that effect in the crisis of his peril would be out of place, because it would not fit the need of the moment; but it would be very much in place at another time, when the need was to avert the repetition of such an accident to somebody else. Men, therefore, owe to men, in the chances and perils of this life, aid and sympathy, on account of the common participation in human frailty and folly. Sumner cautioned his readers that he believed the duty to provide aid and sympathy to others belongs "in the field of private and personal relations, under the regulation of reason and conscience." He didn't believe the existence of this duty justified any sort of state guarantees against hardship. What Social Classes Owe to Each Other contains much more of interest to modern libertarians, including one of the best simple, popular discussions you'll find before the 1940s of the importance of capital to civilization. It's a treasure of the libertarian tradition, and I recommend it wholeheartedly. Perhaps Richard Hofstadter should have read it before he called William Graham Sumner a "social Darwinist." This article is transcribed from the Libertarian Tradition podcast episode "William Graham Sumner (1840–1910)."